Masculine cards have always been a challenge for me, but I can get them done without tears. Sympathy cards, on the other hand, carry too much emotional connection and are, without a doubt, the hardest for me to make. And this one tops them all. My cousin's daughter Mandy lost her battle with Stage 4 Melanoma last weekend. She was only 33 years old, and left behind two beautiful boys, ages 8 and 10. It wasn't even six months after her diagnosis. So yeah, this one was a real toughie for me to make. And that same weekend a dear friend lost her brother, and another friend lost her father-in-law. All to cancer. Three sympathy cards to make...my heart was very heavy. So, here is my public service announcement : please, please, please, if you have a suspicious spot have it checked by your doctor. Melanoma doesn't always look like an ugly dark mole! Mandy's looked like a plantar wart on the bottom of her foot, which didn't respond to normal wart treatment. Even if your doctor says it's nothing to worry about, insist on having a biopsy done if your gut is telling you something's wrong. Image panel: Whisper White 3-1/2" x 4"
Mat behind image: Basic Black 3-5/8" x 4-1/8"
Mat behind embossed panel: Basic Black 4-1/8" x 5-3/8"
I cut a 2-1/2" x 3" rectangle out of scrap paper with my Paper Trimmer to use as a reverse mask. After centering it on the image panel (held in place with painters tape) Lost Lagoon was sponged on the Whisper White, leaving a 1/2" border all around. 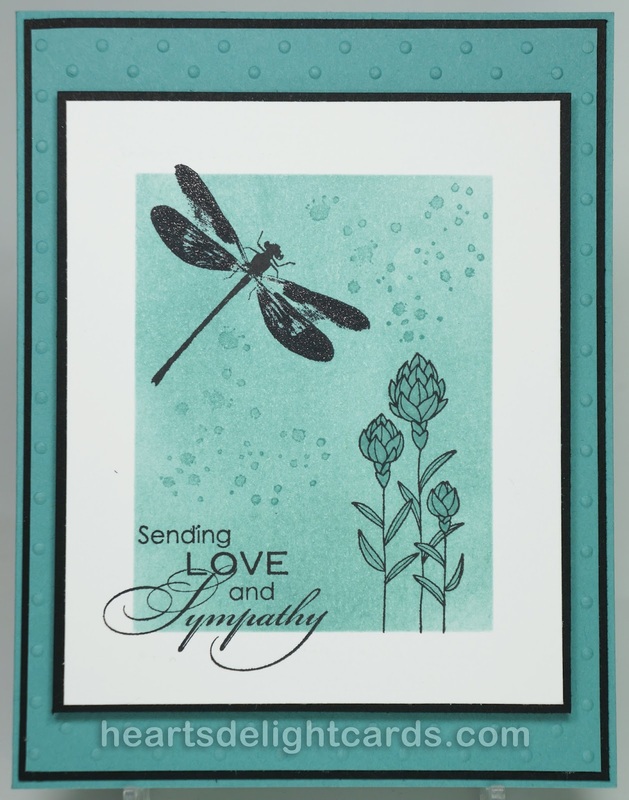 The greeting, flowers and dragonfly were stamped in Basic Black Archival, and some Clear Wink of Stella was added to the dragonfly wings (not visible in the photo). The splats were inked in Lost Lagoon and stamped off once on scrap paper to lighten them before stamping on the image. The flowers were colored with a bit of Lost Lagoon using a Blender Pen. 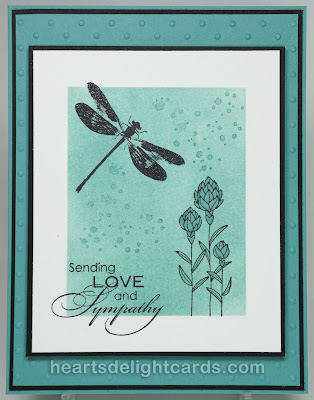 The image panel and mat were popped up on Stampin' Dimensionals. Thank you, Sally. And I agree; sympathy cards aren't something I can just keep on hand. I have to make them for the individual situation, and my heart goes into them. Thank you for "getting" it.